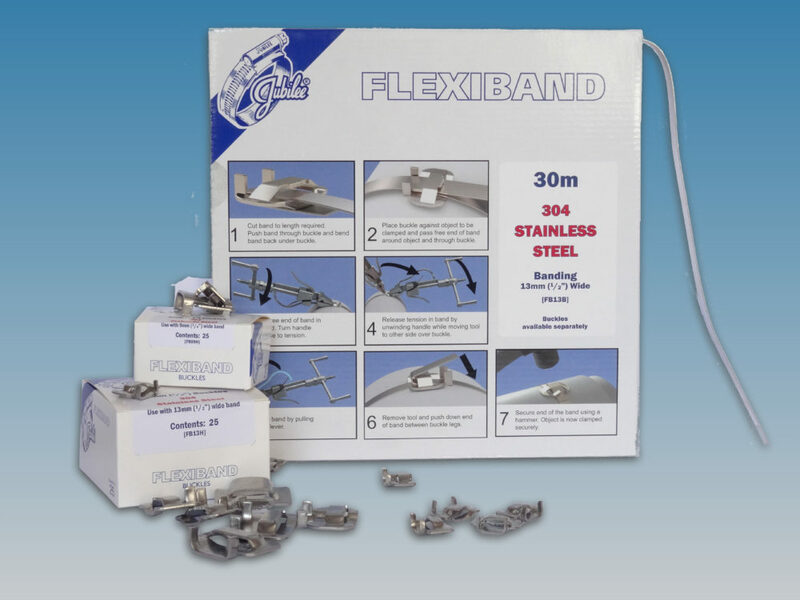 The new Flexiband range will be available in all 304 stainless steel. There will be four different sizes to choose from: 9mm (3/8”), 13mm (1/2”), 16mm (5/8”) and 19mm (3/4”) band width with matching buckles. Both band and buckles will display the Jubilee® stamp, a symbol of quality recognised worldwide. 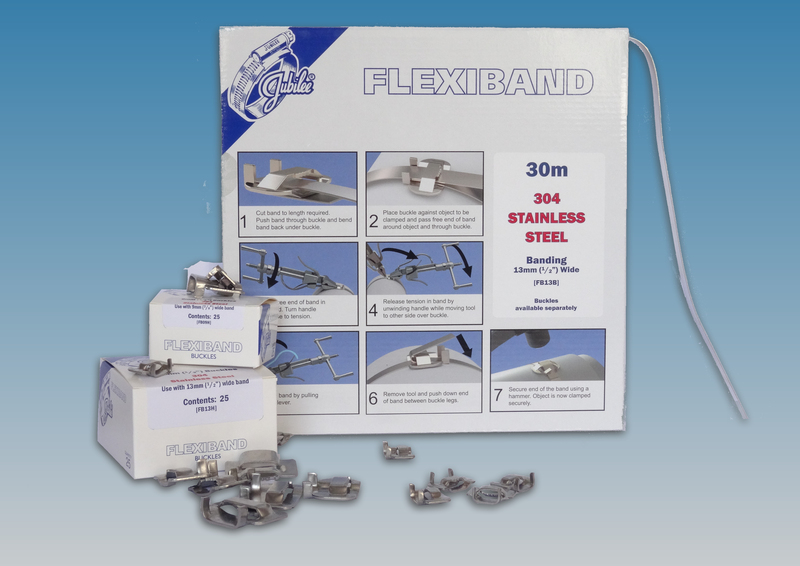 Flexiband banding will be available in dispensers containing 30 metres and buckles will be sold in boxes of 25 pieces. 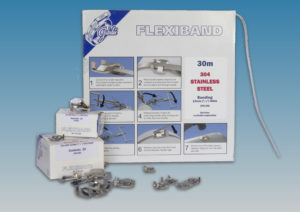 Jubilee®’s Flexiband range is easy to use and will also include a user-friendly assembly tool, vital for ensuring that the banding is fastened correctly. The banding suits virtually any diameter, as it is simply cut to the length required in the assembly tool. For extra strength, the band can be wrapped twice around the object to be clamped and secured through the buckle. Band and Buckle systems are ideal for strapping items securely and can commonly be seen in municipal applications such as sign fixing, where the tamper proof nature of the product is of paramount importance. The low profile of the buckle is also useful where space is a consideration, or where there is a snagging hazard such as on hose assemblies that could need to be dragged along the ground during recoiling (for example). These benefits, combined with the corrosion resistant all stainless steel construction, give a very wide range of industries where Jubilee Flexiband can offer optimal performance, including industrial applications, agriculture, automotive, civil engineering, marine, food and petrochemicals and offshore oil and gas. You can see the new Jubilee® Flexiband at IFAT, the leading trade show for waste water technology from the 14-18 May in Munich. IFAT is the ideal platform to launch Flexiband, as major markets for this type of product are utilities and municipal applications. The Flexiband range will be available via Jubilee® Clips’ network of trusted distributors from June 2018.